Invested in an expensive toilet seat bidet? But your hard water supply might soon render it useless. Hard water often contains calcium ions that can combine with other salts and deposit on the surface of the toilet and the bidet. Not only do they leave yellow marks on your toilet, but they might also clog your bidet. Sediments are another issue that might end up disturbing the function of a bidet. So, in such a case, do you stop being these hygienic accessories? The simple answer? No. Bidet water filters are here to save your day! These amazing devices are simple to use and install and will generally extend the life of your bidet. Why You Should Use A Bidet Seat Water Filter? How to Install Bidet Water Filter? A bidet seat water filter can help your bidet function more properly. The bidet is actually a system of hoses and other kinds of pipes through which water flows. The water might contain impurities that might settle and build up over time. However, if you have a filter before the water can enter the bidet, then the filter will essentially remove all impurities such as calcium and sediment. This will ensure no sediments build up inside the bidet over time or clog it. It will help to increase the lifespan of your expensive bidet toilet seat and bidet toilet combo. Apart from that, bidet filter water is pure and does not irritate sensitive skin. Since you use a bidet to wash a very sensitive part of your body, you should ensure that the water is free of any irritants. That keeps the bidet water safe to use. Simply attach the female end of the filter with the male end of the T-valve. Attach the other male end of the filter with the bidet hose. 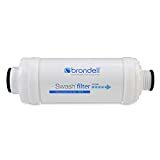 The Brondell Swash SWF44 Bidet filter is the perfect filter to remove all kinds of contaminants from the toilet water. The filter works in 3 effective ways to remove all contaminants. The first is by removing large sediments. Larger sediments and particles can often invade into the toilet seat bidet and ruin the working mechanism. The Swash Bidet Filter helps in keeping your bidet fully functioning by removing these particles. However, that’s not all! The Bidet filter also uses granulated carbon to help filter out chlorine. Chlorine can be a very damaging chemical on the skin. It can dry your skin out. So, the chlorine filter effectively removes any chlorine left in the water. Most toilets and bathroom accessories become a victim to calcification caused due to hard water. 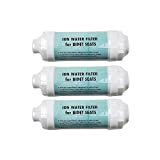 However, the Swash seat filter allows ion exchange with the calcium ions to prevent any calcium build up from the hard water. This ultimately reduces clogging problems and will save you hundreds of dollars in repair costs. Why should you buy this filter? Well, it contains more filter material than any other seat filter in the market. It weighs about 60% more to ensure you don’t run out quickly. The bidet seat water filter remains effective for more than 6 months. It is compatible with all types of toilets and seats. Even the installation of this seat filter is quite easy. All you need to do is connect it in between the hose and the seat outlet. So, you can say goodbye to calcium buildups and chlorine all in one go. Removes Chlorine, calcium, and particles from the water. Lasts longer than most other filters. Reduces clogging problems and repair costs. Not very attractive or discreet. See also our picks for Brondell Bidet Toilet Seat. 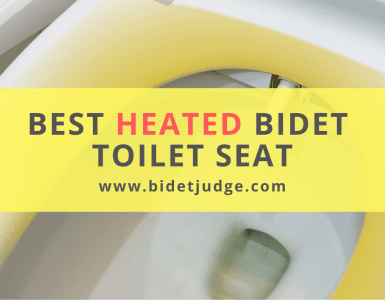 Bio Bidet is a revered brand amongst seta bidets providing users with top quality bidet seats and other toilet accessories. So, it’s no surprise that they came up with their very own Electronic Bidet Water Filter. These are the best bidet water filter in terms of longevity. With an average use, they can last anywhere from 6 to 9 months. If the bidet water is polluted and contains sediments and calcium, it can eventually destroy your bidet and its functions. Calcium buildups and sediment cannot only clog your bidet nozzles but will eventually clog your toilet as well. Calcium buildups are known to ruin the look of the toilet as well. You would often notice yellow streaks on your ceramic surfaces. This is where the Bio Bidet comes in handy. It protects the toilet bidet against any sediment and mineral build up. It has efficient filters in it that prevent any particles from entering the bidet. This ultimately results in an increased lifespan of electronic bidets. 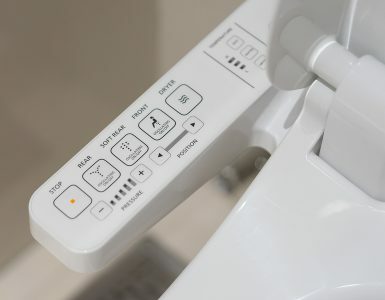 The Bio Bidet CF100 is perfect to be used on a number of different Bio Bidet toilets such as Supreme BB-1000, Prestige BB-800, Harmony BB-400, and even the Bliss series. However, since the fittings are standard sized, the water filter will be compatible with any toilet seat bidet. The seat filter is quite easy to install as well. It simply needs to be connected to the water inlet valve on one end and the bidet hose on the other. Changing and replacing it is quite easy as well. All in all, The Bio Bidet CF100 is perfect for all kinds of toilets and will increase their lifespan! Increases the longevity of the water bidets. Quick and easy to install and replace. Compatible with a number of different toilets. Lasts up to 9 months. Not made of a durable material. 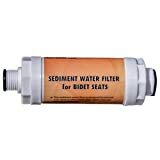 When looking for bidet seat water filters, you need to ensure that the filter you buys fits the toilet connections well. However, this is not always the case and you might end up making a mistake. This is where the Clean Sense Spa IF3 comes along. The best part about this filter is that it can fit a standard sized 0.5-inch fitting. This means that you can simply buy this one filter for all your toilets. The filter has a total of 2 connections on either side, one for male and the other for female. It is also available in a 3 pack which is bound to last you for a long time. In fact, the Clean Sense holds the reputation of having a long life of up to 6 months. These are essentially inline ion water filters that help soften the water to remove impurities and minerals. This is because the ionizer adds more negative ions into the water to make it clean faster. They keep calcium from building up inside your toilet. They also capture large to very small sediments and particles. 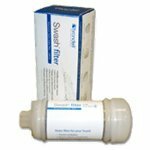 The ion filter is the best choice for those who live in areas where more and more hard water is used. It could eventually extend the life of your toilet as well as your bidet. The best part is that you don’t even need a plumber for installation since all you need to do is attach it between the T-valve and the water hose leading up to the bidet. Comes in a 3-pack so you can use it on multiple toilets. Fits all standard toilet connections. Captures sediments and removes calcium buildup. Lasts for about 6 months. Don’t need a plumber to install. Hygiene for health is a consumer-centered brand who care for the needs of their customers. They have been in the bidet business for ages. However, they soon noticed that impurities in the water line were causing their bidets to leak and damage. So, they spent about 3 years researching a solution and finally came up with the best bidet water filter. The bidet seat water filter meets all guidelines and is recommended by bidet manufacturers all over the world. The model is available in two types: ion and sediment water filter. 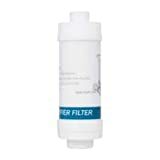 The sediment water filter is for those who face a lot of particle impurities in their water supply, while the ion filter effectively removes minerals that might build up and result in impurities. The Hygiene for Health filter fits a ½ inch fitting with a male and female connection at each end. The ion filter is quite nice as it adds negative ions and softens the water. It even captures particle matter. This filter has a huge capacity as it can purify 410 gallons of water or can be used for about 1500 flushes. The sediment filter is only for removing small particles such as grit, sand, rust that can cause harm to the inner workings of the bidet. Both the filters help extend the life of the bidet. Plus, you don’t even need to buy them again and again. One unit will last you anywhere up to 9 months. Installation is quite easy. However, we do dislike that the packaging is quite distractive. We would have preferred a more invisible kind of bottle that stays discreet and helps add to the beauty of a gorgeous modern toilet. Comes in two types: ion and sediment filter water. Fits the standard ½ inch supply. Living in a place where the water is loaded up with sediments can be a nightmare for your toilet appliance. Some people get their water from a well or through boring into the groundwater supply. Whatever the case, this water might be loaded with sediments. When these sediments enter a bidet, they cannot pass through the small nozzle and may end up clogging the device. For this, you need a filter that will stop all such particles from entering the toilet in the first place. The Bidet Filter Sediment Water Filter is one of the best bidet water filters due to its durability and longevity. The filter is actually a bottle with two connecting ends. Inside the bottle are graduated filters starting from large sized to smaller ones. The bottle is made of a durable hard plastic that does not leak or break after months of use. Even the filters are high quality so you can rest assured that the filter will last greater than 6 months. The best part about this filter is that it can fit all kinds of ½ inch fittings. A ½ inch is a standard size and will enable you to use the filter for all kinds of the bidet. You can easily install it between the water supply in your bathroom and the cold or hot water hose of the seat bidet. All in all, if you want an affordable yet functional inline sediment water filter, you can never go wrong with the Sediment Filter. It helps you save money on repair costs. Has a long life of about 6 months. Stops all kinds of particles from entering the toilet appliances. Fits all kinds of toilet seats. Not suitable for hard water. Another one from Brondell, the SWF Swash Ecoseat bidet filter is the perfect companion for any Swash Ecoseat 100 model. However, we were disappointed to find out that it was not compatible with any other toilets, not even more Eco seats one. This is basically a two-in-one filter that works as an ion filter as well as the particulate filter. The filter effectively removes all sizes of particles ranging from very small to very large. The ion filter inside works like a charm and effectively removes all calcium or other minerals. This, in turn, will save you a lot of money as your bidets last longer without the mineral or sediment deposit. The filter is quite small and has a modern look that goes well with any stylish toilet. It only measures about 4 1/2” (L) x 1 3/4” (W) which means you can easily hide it away out of sight. The outlet and the inlet valves are only suitable for 3/8 inches diameter valves. The efficient filter component is the nano-silver ceramic composite. This composite works quite well in removing all sediments by trapping them inside the bottle while the ions inside help with the calcium ion exchange to soften the water. 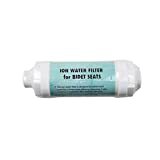 The durable and sturdy bidet seat filter is perfect for all those who wish to enhance the life of their bidet at the least possible cost. So, you can have a functional toilet bidet that even looks attractive without all the calcium buildup. Prevents calcium from building up. Removes all sediments and particulates from the water stream. Extends the life of the bidet. Durable and sturdy filter component. Only suitable for one model of the Eco Swash Bidet Seats. A little harder to install. 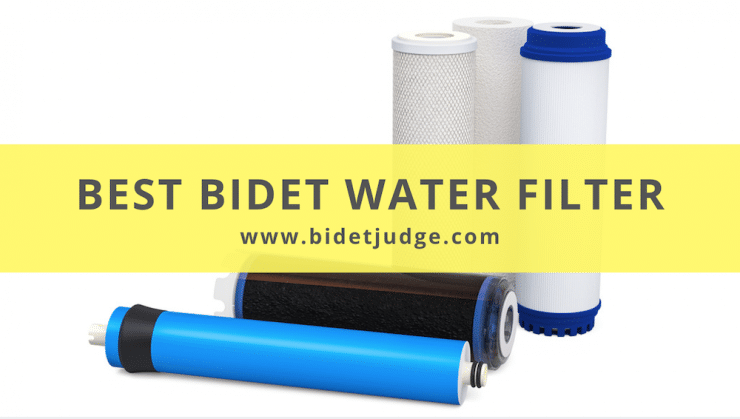 All in all, whether you’re suffering a case of hard water or wish to minimize the number of sediments that pass through your bidet, any of these bidet filters will suit you well. These bidet filters are bound to help you extend the life of your bidet and reduce the most annoying clogging problems. Not only this, but they are a great investment. They are quite affordable and help you reduce any calcium buildups that might ruin the look of your modern and sleek toilet. So, for anyone who faces a lot of hard water in their supply, these best bidet water filters are a must.